You’ll enjoy wine more when you know a bit more about it. Wine glasses available at Sur La Table. 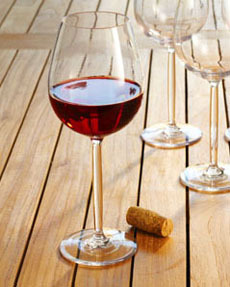 CAPSULE REPORT: Wine experts can find all of the nuances of flavor and aroma in a glass of wine. Why look for the aromas and flavors—why not just drink and enjoy the wine? Part of the enjoyment is understanding how wines differ from each other, and that starts with noticing if the fruit smells or tastes like berries (cherries, raspberries or strawberries, for example), raisins or currants, or other fruits. It helps to understand the options, and we’ve provided them on Page 2 and Page 3. This is Page 1 of a six-page article. Click on the black links below to visit other pages. As your glass of wine is exposed to air, as it warms in the glass, it will evolve and new aromas and flavors will reveal themselves. Often, off-putting odors will blow off—so keep an open mind if your initial reaction is not favorable. Pioneering work in making sense of the flavor and aroma components was done by Professor Ann C. Noble of the University of California at Davis, Department of Enology and Viticulture. She developed the Aroma Wheel to provide a common platform for the descriptions of aromas and flavors of wine. It is an invaluable and inexpensive aid that immediately “explains it all for you,” much more than the chart on Page 2 and Page 3 can. It can be purchased from Professor Noble at WineAromaWheel.com. The original Wine Aroma Wheel. Get yours at WineAromaWheel.com. 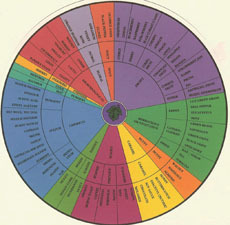 If you don’t want to send for the Wine Aroma Wheel, charts that follow on the next two pages contain descriptors from a variety of sources including our own experience. It is not meant to be definitive, but to create an awareness of the broad variety of aromas and tastes that can be identified in glasses of wine made from different types of grapes, and to give you some vocabulary with which to discuss wine. Each varietal has characteristic flavors and aromas; for example, Gewürtztraminer’s lychee, Riesling’s diesel or kerosene, Zinfandel’s pepper and spice, Pinot Noir’s red berry fruit (cherry or raspberry). Within these broad pointers, there are dozens of flavors and aromas to be explored. Since grapes take on added dimensions depending on where they are grown, the effects of the vintage year, and their age, it’s often difficult even for experts to tell a wine “blind.” At best, the most knowledgeable palates decipher the clues and make an educated guess (and have fun doing it).